My husband will attest to the fact that I’m definitely NOT a clean and tidy person. 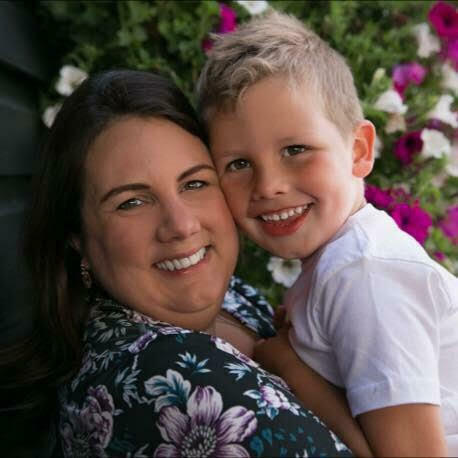 I know lots of people shy away from messy play but I quite enjoy it – it’s different, creative and fun. However, I’m still always a little concerned about how my neat husband will react to the mess! So, when we decided to try out the Slime & Gelli Baff products from Zimpli Kids I decided to confine the mess to the bathroom and garden. As soon as I saw these Zimpli Kids You Tube demos I knew I had to get my hands on this stuff. Both formulas look so tactile and interesting, I could tell they would really excite Caterpillar, plus I was curious to see if the magic powder does indeed disintegrate the Gelli formula. As you’ll see from the films they are designed to fill an entire bath but we decided to just test in a bowl. The set up is fairly straight forward – you just add the powder to water in accordance with the ratio on the packet. I did find that it took more time and more powder than I was expecting to dissolve and turn to a slime consistency – I wondered if I perhaps I didn’t have the water warm enough. The instructions didn’t mention hot water but given the product is designed for kids to bathe in it would make sense. After a bit of trial and error we got the consistency right and could get down to playing! Caterpillar was fascinated by the slimy texture and I loved the feel myself – really smooth, stretchy and slippery. It’s fun on it’s own but we found, for an added bonus, that incorporating other toys into the mix was a really good game too. First we got his dinosaurs involved and had them emerge from the slimy swamp and battle each other. Then we got some smaller toys (Caterpillar is currently loving the Stikeez you get free in Lidl and these are the ideal size) and I buried them for Caterpillar to dig out and find. We incorporated some counting and colours work here too. We did end up tipping the bowl of slime into the bath so Caterpillar could get really involved, he loved slipping and sliding around and couldn’t stop laughing when he got covered in the slime. I think we will have to try a whole bathful at some point. 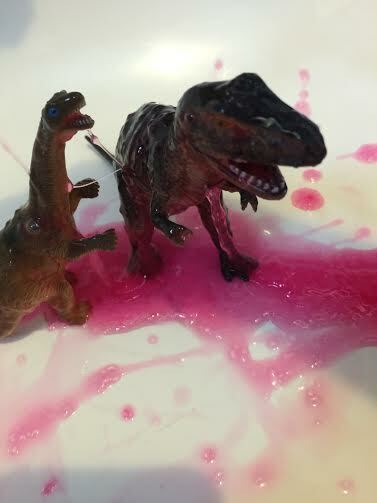 He also enjoyed using the shower hose to clean off his dinosaurs so we certainly got a lot of different play from the Slime Baff. 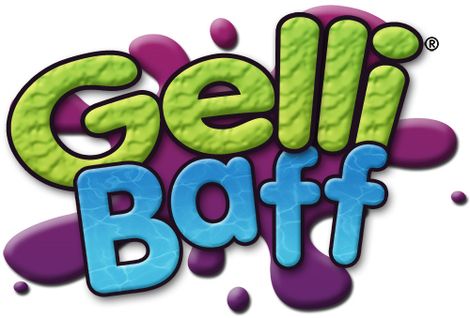 The Gelli Baff powder was much easier to make up – it changes water literally instantly to a squishy, jelly consistency. 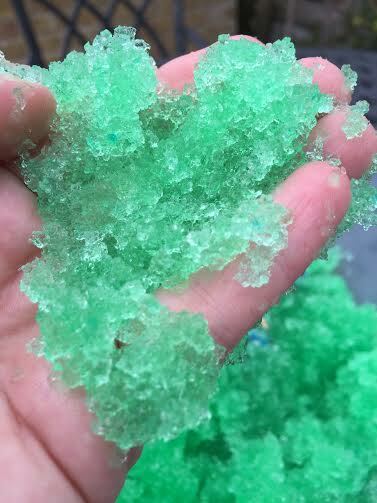 After what happened with the Slime Baff I actually put a little too much powder in at first so we got a really chunky, sticky consistency at first and the crystallised appearance was actually really pretty to look at too. In this more solid state we found you can almost form balls and shapes. We added a little more water and it transformed again into the more gloopy jelly goo we had expected, much more fun and again we both really enjoyed the unusual texture. Caterpillar appeared to prefer this texture to the slime and played a lot longer, burying toys again and transferring from one container to another. The Gelli Baff is completely odourless and the bright green we received is another great colour. I was very curious to see if the dissolver worked as well as it appeared in the video. It definitely does (as you can see from these before and after photos) although I must admit we needed much more dissolver than the Gelli Baff powder. I used about a third of the Gelli tester sachet I was sent but all of the dissolver sachet. It did disolve most of it though, however as there were still a few jelly bits in the bottom and I didn’t feel completely comfortable throwing straight down the sink, so I drained it and threw the more solid bits away instead. This could be either me being overcautious or because I used a little too much power-to-water in the first place. The Baff products are non-staining and come in a pink, red, blue and green. They are completely safe on the skin and don’t have an unpleasant scent. 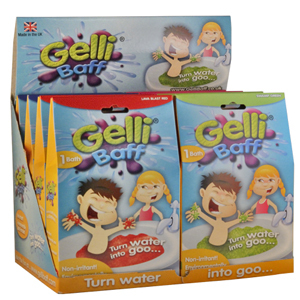 As well as the original formula, the Gelli Baff also comes in colour changing and Smelli Gelli. At only £4.99 a pack I think they are pretty good value too – that gives you enough for a whole bath but if you wanted to just dissolve a bowl amount instead, like we did, you’d get several from that. Really cool for a gift or stocking filler too. 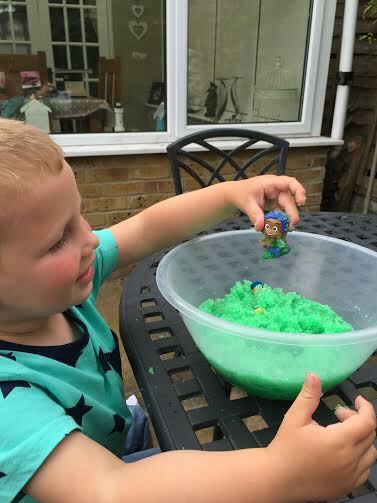 They are fantastic for sensory play and perfect if you’ve got children who love getting messy. A great idea for messy play sessions at play groups or messy play classes & parties too. The only downside, aside from the tricky dissolving, is the clean up. The Gelli Bath comes with a dissolving powder which, as I say, did work, but for the Slime Baff simply adding more water is supposed to loosen the formula and it can then be safely drained away. Considering we only used a bowlful I found I had to add a fair bit of water for the slime texture to reduce enough for me to drain it. It does leave some residue in the bath tub too but you can wash this away with the shower spray and a bit of rubbing. All in all, a really fun and unique product that your toddlers & preschoolers will really enjoy and the excited look on Caterpillar’s face made up for the clean up. To try Gelli Baff and Slime Baff for yourselves visit www.zimplikids.com. 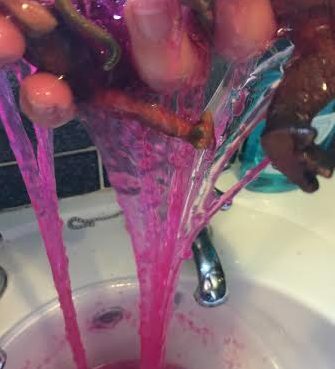 Disclosure: we received Gelli Baff and Slime Baff in exchange for an honest review – opinions and content all my own.